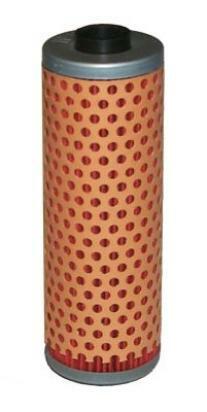 The picture below shows a Oil Filter HiFlo. Thousands of other top quality spares listed on our website at refreshingly low prices. HiFlo is the best selling aftermarket oil filter, and it's not difficult to see why. Hi Flo filters are built with the finest quality materials for the best reliability and filtration; the composite filtering material is compatible with all lubricants (including synthetic), as is the heat treated adhesive. Hi Flo use metal end caps - not paper like some other aftermarket filters - and the folded filter material is kept in place with a stainless steel mesh. All manufacturing and quality control checks are carried out within HiFlo's own factory. Filters go through 16 quality control checks using the latest in pressure testing machinery, and all HiFlo filters have a "burst factor" of at least 4 - they are tested to pressures 4 times higher than ordinary use in a motorcycle, scooter or ATV engine. HiFlo is the world's first TUV approved oil filter - and they meet and exceed all OEM specification. Changing your oil and oil filter can be a messy business. Make sure you've got all the tools and oil required before you start.